Digital Living Network Alliance (DLNA) (originally named Digital Home Working Group, DHWG) was founded by a group of PC and consumer electronics companies in June 2003 (with Intel in the lead role) to develop and promote a set of interoperability guidelines for sharing digital media among multimedia devices under the auspice of a certification standard. DLNA certified devices include smartphones, tablets, PCs, TV sets and storage servers; in a typical use case, a user sends videos, pictures or music from their smartphone or storage server through their home WLAN to a TV set or tablet for display. The group published its first set of guidelines in June 2004. The guidelines incorporate several existing public standards, including Universal Plug and Play (UPnP) for media management and device discovery and control, and widely used digital media formats and wired and wireless networking standards. DLNA works with cable, satellite, and telecom service providers to provide link protection on each end of the data transfer. The extra layer of digital rights management (DRM) security allows broadcast operators to enable consumers to share their content on multimedia devices without the risk of piracy. In March 2014, DLNA publicly released the VidiPath Guidelines, originally called "DLNA CVP-2 Guidelines." VidiPath enables consumers to view subscription TV content on a wide variety of devices including televisions, tablets, phones, Blu-ray players, set top boxes (STBs), personal computers (PCs) and game consoles without any additional intermediate devices from the service provider. As of September 2014, over 25,000 different device models had obtained "DLNA Certified" status, indicated by a logo on their packaging and confirming their interoperability with other devices. It was estimated that by 2017 over 6 billion DLNA-certified devices, from digital cameras to game consoles and TVs, would be installed in users' homes. As of June 2015[update] the organization claimed membership of "more than 200 companies". On January 5, 2017, DLNA announced on its web site that "the organization has fulfilled its mission and will dissolve as a non-profit trade association." Its certification program will be conducted by SpireSpark International of Portland, Oregon. Intel established the DLNA along with Sony and Microsoft in June 2003 as the Digital Home Working Group, changing its name 12 months later, when the first set of guidelines for DLNA was published. 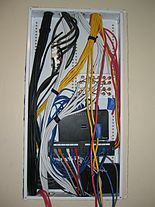 Home Networked Device Interoperability Guidelines v1.5 was published in March 2006 and expanded in October of the same year; the changes included the addition of two new product categories — printers, and mobile devices — as well as an "increase of DLNA Device Classes from two to twelve" and an increase in supported user scenarios related to the new product categories. Digital Media Server (DMS): store content and make it available to networked digital media players (DMP) and digital media renderers (DMR). Examples include PCs and network-attached storage (NAS) devices. Digital Media Player (DMP): find content on digital media servers (DMS) and provide playback and rendering capabilities. Examples include TVs, stereos and home theaters, wireless monitors and game consoles. Digital Media Controller (DMC): find content on digital media servers (DMS) and instruct digital media renderers (DMR) to play the content. Content doesn't stream from or through the DMC. Examples include tablet computers, Wi-Fi enabled digital cameras and smartphones. Mobile Digital Media Server (M-DMS): store content and make it available to wired/wireless networked mobile digital media players (M-DMP), and digital media renderers. Examples include mobile phones and portable music players. Mobile Digital Media Player (M-DMP): find and play content on a digital media server (DMS) or mobile digital media server (M-DMS). Examples include mobile phones and mobile media tablets designed for viewing multimedia content. Mobile Digital Media Uploader (M-DMU): send (upload) content to a digital media server (DMS) or mobile digital media server (M-DMS). Examples include digital cameras and mobile phones. Mobile Digital Media Downloader (M-DMD): find and store (download) content from a digital media server (DMS) or mobile digital media server (M-DMS). Examples include portable music players and mobile phones. Mobile Digital Media Controller (M-DMC): find content on a digital media server (DMS) or mobile digital media server (M-DMS) and send it to digital media renderers (DMR). Examples include personal digital assistants (PDAs) and mobile phones. Mobile Network Connectivity Function (M-NCF): provide a bridge between mobile handheld device network connectivity and home network connectivity. Media Interoperability Unit (MIU): provide content transformation between required media formats for home network and mobile handheld devices. The specification uses DTCP-IP as "link protection" for copyright-protected commercial content between one device to another. Arris, AwoX, Broadcom, CableLabs, Comcast, Dolby Laboratories, Intel, LG Electronics, Panasonic, Samsung Electronics, Sony Electronics, Time Warner Cable, and Verizon. Neither Google nor Apple are members. Apple's proprietary Digital Audio Access Protocol preceded DLNA's UPnP protocols. There are over 25,000 DLNA-certified products on the market, up from 9,000 in 2011. This includes TVs, DVD and Blu-ray players, games consoles, digital media players, photo frames, cameras, NAS devices, PCs, mobile handsets, and more. According to a study from Parks Associates, nearly 3 billion products are on the market in 2014 reaching up to over 7 billion by 2018. Consumers can see if their product is certified by looking for a DLNA logo on the device or by verifying certification through the DLNA Product Search. Manufacturers can seek certification testing from a DLNA Accredited Independent Certification Vendor such as the UNH InterOperability Laboratory, Allion Labs, CESI Technology Co., Digital TV Labs, XXCAL or Testronic. The vendors of software are allowed to claim that their software is a DLNA Technology Component if the software has gone through certification testing on a device and the device has been granted DLNA Certification. DLNA Technology Components are not marketed to the consumer but only to industry. DLNA Interoperability Guidelines allow manufacturers to participate in the growing marketplace of networked devices and are separated into the below sections of key technology components. In 2005, DLNA began a Software Certification program in order to make it easier for consumers to share their digital media across a broader range of products. DLNA is certifying software that is sold directly to consumers through retailers, websites and mobile application stores. With DLNA Certified software, consumers can upgrade products from within their home networks that may not be DLNA Certified and bring them into their personal DLNA ecosystems. This helps in bringing content such as videos, photos and music stored on DLNA Certified devices to a larger selection of consumer electronics, mobile and PC products. AwoX mediaCTRL is a commercial server. It is based on AwoX DLNA Technology component software development kits. CyberLink SoftDMA 2. Appears to be just a DMP. ARRIS Whole Home Media Gateway is a DLNA Certified DMS. ARRIS Whole Home Media Player is a DLNA Certified DMP. Most Smartphones share multimedia including music, pictures or videos. Microsoft Xbox 360 is a DLNA Certified DMP. Sony PlayStation 3 is a DLNA Certified DMP. AllShare (UPnP, DLNA), a Samsung-branded media server for MS Windows. Clients are also available for mobile Android devices. Effective for streaming content over a local network to Samsung devices, notably televisions. Ampache started in 2001 as an OpenSource project at Oregon State University and continues active development as streaming media server of UPnP/DLNA compatible devices and your own music collection. ArkMC is a wireless media server application (iOS/Android) oriented on a UPnP/DLNA compatible devices. Asset UPnP (DLNA compatible) from Illustrate. An audio specific UPnP/DLNA server for Windows (including Windows Home Server), QNAP, Apple OS X (Mountain Lion or newer), Debian Linux and Raspberry Pi. Features music library, album art, audio WAVE/LPCM transcoding from a huge range of audio codecs, ReplayGain, support for streaming audio in many formats including lossless Flac, Wav, MP3 and playlists, and a customizable browse tree. Companion products "dBpoweramp CD Ripper" for CD ripping and "dBpoweramp Music Converter" for converting digital music formats can be used in compiling a digital music library. Coherence is a framework written in Python to enable applications access to digital living network resources. As a stand-alone application it can act as a UPnP/DLNA media server, in combination with a supported client as a media renderer. CyberLink Media Server 2. Appears to be just a DMS. Home Media Center, a free and open source media server compatible with DLNA. Includes web interface for streaming content to web browser (Android, iOS, …), subtitles integration and Windows desktop streaming. This server is easy to use. Jamcast, a DLNA-compliant media server for Microsoft Windows that is capable of streaming any audio playing on the PC to DLNA devices. JRiver Media Center, DLNA media server for Windows and Mac. Also includes Renderer and Controller. KooRaRoo Media (UPnP, DLNA, HTTP), a multimedia organizer and a media server for Windows. On-the-fly transcoding, supports multiple video/audio streams in files, includes a DMS (server) and a DMC (controller) with "play to" functionality. Works with all DLNA-compatible devices. Mezzmo is a feature-packed UPnP/DLNA media server with on-the-fly transcoding and media organizing features. Nero Media Home is a UPnP/DLNA Media Server on the Windows platform, streaming music, videos, photos, and TV shows, It allows to play back your media files on most popular devices including Xbox and PlayStation. Pixel Media Server is a DLNA-compliant digital media server for Android platform. It turns your phone/tablet into a DLNA media server for publishing content (image, audio, video) from your device to the DLNA home network. PlayOn from MediaMall appears to be a DMS, also capable of serving streamed internet media such as Netflix, Hulu, Google YouTube, CNN, ESPN. Plex Media Server — the back-end media server component of Plex software suite. PS3 Media Server, an open source (GPLv2) DLNA compliant UPnP Media Server for the Sony PS3, written in Java, with the purpose of streaming or transcoding any kind of media files, with minimum configuration. ReadyMedia (formerly known as MiniDLNA) is a simple open source media server software, with the aim of being fully compliant with UPnP/DLNA clients. Rygel is an open source media server software, written in Vala programming language. Serviio is a UPnP/DLNA media server and works with any DLNA compliant device with the purpose of streaming or transcoding any kind of media files (TV, Sony PlayStation 3, etc.) and some other (MS Xbox 360). Frequently updated, has a good support community. Available on Windows, Apple Mac OSX, Linux and Synology NAS platforms. TwonkyMedia server runs on Windows, Mac OS X, GNU/Linux and Android and enables media sharing of local and online media among a large variety of devices. TVMOBiLi – A shareware DLNA/UPnP Media Server for MS Windows, Apple Mac OS X and GNU/Linux. Appears to be just a DMS. TVersity, a DLNA MediaServer with strong device support and on-the-fly transcoding. Appears to be just a DMS. Wild Media Server (UPnP, DLNA, HTTP), a media server for MS Windows, Wine (GNU/Linux), Wineskin on macOS, featuring individual device settings, transcoding, external and internal subtitles, restricted device access to folders, uploading files, Internet-Radio, Internet-Television, Digital Video Broadcasting (DVB), DMR-control and "Play To", Music (Visualization), Photo (Slideshow), support for 3D-subtitles, support for music fingerprints, Web-navigation with HTML5 player. ^ a b c d Digital Living Network Alliance (n.d.). "Frequently Asked Questions About DLNA". Archived from the original on July 25, 2008. Retrieved June 26, 2015. ^ a b Digital Living Network Alliance (June 22, 2004). "DLNA Strides Toward Consumer-Friendly Home Networked Devices with New Interoperability Guidelines" (PDF) (Press release). San Francisco. Archived from the original (PDF) on February 5, 2005. Retrieved June 26, 2015. ^ a b Digital Living Network Alliance (n.d.). "About Us: Organization". Retrieved June 26, 2015. ^ Digital Living Network Alliance (n.d.). "DLNA for HD Video Streaming in Home Networking Environments" (PDF). p. 4. Archived from the original (PDF) on June 30, 2011. Retrieved June 26, 2015. ^ Digital Home Working Group (June 24, 2003). "17 Leading Companies Form Working Group to Simplify Sharing of Digital Content Among Consumer Electronics, PCs, and Mobile Devices" (Press release). San Francisco. Archived from the original on August 16, 2004. Retrieved June 26, 2015. ^ Grabham, Dan (March 22, 2013). "DLNA: What It Is and What You Need to Know". Techradar. ^ a b Editor. "DLNA intros VidiPath". Advanced Television. Advanced Television. Retrieved 2 February 2015. ^ "The DLNA Certified Logo Program". Sony. Archived from the original on 2010-06-12. Retrieved 2011-03-02. ^ a b "DLNA Market Overview Report". DLNA. Parks Associates. Retrieved 2 February 2015. ^ "Certified® Device Classes". DLNA. Archived from the original on 2010-12-22. Retrieved 2011-03-02. ^ "DLNA® Announces 3.0 Certification Program and Updated Guidelines Helping Manufacturers Differentiate Product Offerings". DLNA. Retrieved 2017-03-01. ^ "DLNA 4.0 Transforms Connected Home Experience". DLNA. Retrieved 2017-03-01. ^ "UPnP and DLNA—Standardizing the Networked Home". Instat. Archived from the original on 2011-01-04. Retrieved 2011-03-02. ^ UNH InterOperability Lab . ^ Digital TV labs . ^ "IO Mega not DLNA compliant", The register, UK, 2009-03-02 . ^ "The DLNA Networked Device Interoperability Guidelines". DLNA. Archived from the original on 2010-12-23. Retrieved 2011-03-02. ^ "Network and Connectivity". DLNA. Archived from the original on 2010-12-22. Retrieved 2011-03-02. ^ "Device and Service Discovery and Control". DLNA. Archived from the original on 2010-12-22. Retrieved 2011-03-02. ^ "Media Format and Transport Model". DLNA. Archived from the original on 2010-12-22. Retrieved 2011-03-02. ^ "Media Management, Distribution, and Control". DLNA. Archived from the original on 2010-12-22. Retrieved 2011-03-02. ^ "Digital Rights Management and Content Protection". DLNA. Archived from the original on 2010-12-22. Retrieved 2011-03-02. ^ "Manageability". DLNA. Archived from the original on 2010-12-22. Retrieved 2011-03-02. ^ "DLNA Certification Program". Archived from the original on 2013-08-19. ^ "Increasing DLNA Software Certification Will Propel the Adoption and Connection of Devices within the Home Network" (press release). ABI research. ^ Certified Products (search), DLNA . ^ Remote. "mediaCTRL pour PC". Awox. Archived from the original on 2013-01-28. Retrieved 2013-03-12. ^ "Network Media Solutions – OEM/ODM Modules and Embedded Technologies for the Digital Home". Awox. Archived from the original on 2011-07-07. Retrieved 2011-03-02. ^ "SoftDMA 2 – Media Player for the Digital Home". Cyberlink. Archived from the original on 2011-02-14. Retrieved 2011-03-02. ^ a b "DTR 2011: ARRIS Whole Home Solution Media Gateway & Player". Broadband Technology Report. 31 October 2011. ^ a b Richard Lawler (21 May 2012). "Arris reveals Moxi DVR release 2.0 with web browser, apps and iPad remote". Engadget. ^ "Connect DLNA", Xbox 360, Microsoft . ^ "Connect DLNA", Playstation 3, Sony . ^ "AllShare download". Samsung. Archived from the original on 2012-02-15. Retrieved 2012-01-30. ^ "Media Server 2 – Media Server Software for the Digital Home". Cyberlink. Archived from the original on 2011-02-14. Retrieved 2011-03-02. ^ "Jamcast" (home page). SDS technologies. 2010-11-23. Retrieved 2011-03-02. ^ "JRiver Media Center" (home page). JRiverr. 2013-08-02. Retrieved 2013-08-02. ^ "KooRaRoo Media". Programming Sunrise. Retrieved 2012-07-04. ^ Conceiva. "The Ultimate DLNA Home Entertainment Software". Mezzmo. Retrieved 2011-03-02. ^ Pixel Media Server - DMS, Google Play . ^ "PlayOn Digital Media Server". PlayOn. Retrieved 2011-03-02. ^ "PS3 media server". Code (project hosting). Google. Retrieved 2011-03-02. ^ "TV mobili". Retrieved 2011-03-02. ^ "Home". TVersity. 2007-06-17. Retrieved 2011-03-02. ^ "Supported Devices". TVersity. Retrieved 2011-03-02. ^ "Wild Media Server (UPnP, DLNA, HTTP)". .
Digital Living Network Alliance, Sony . DLNA History, Discussion of standard, Mission, CES participation and member companies, Mahalo . This page was last edited on 31 March 2019, at 07:29 (UTC).